ABOUT: Pantoney’s Crown is a remarkable mesa rising from the Capertee Valley (the worlds widest canyon). It is hard to get close to but can be viewed from various lookouts. 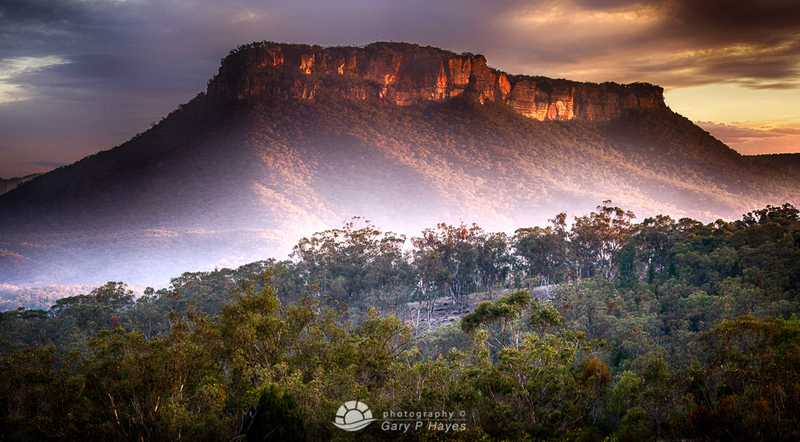 My favourite is from Glen Davis road but Pearsons Lookout has a distant view. Sunset is best from various locations between 17-21km from Capertee on Glen Davis road and as the sun lights up the top section of this stunning rock. But there are a few farm tracks (mostly private) which will get you closer. PHOTO EQUIPMENT TO BRING: For distant shots of Pantoney’s Crown from Glen Davis, a 200mm+ but a 85mm to keep some of the environment in shot. Tripod essential to keep image sharp here. GETTING TO THE SPOT/S: Park along Glen Davis road on this map or a few km or so either side for personal taste. There are a few tracks which will get you closer but private land can be an issue. This us beautiful sunset. I want to go there for see it…. Great…?!! !